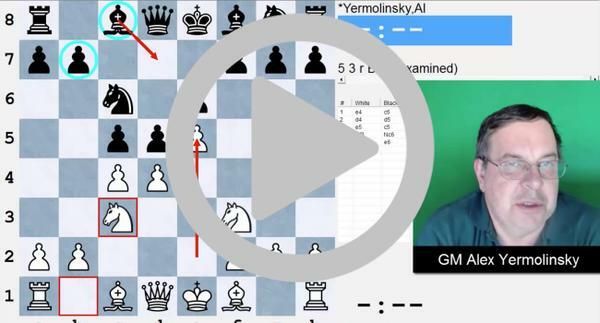 BUILD YOUR OPENING REPERTOIRE with GM Alex Yermolinsky [50% OFF] | Free chess downloads and training sites. Study material and suggestions. Online shopping. don’t you want to have an amazing opening repertoire that you can rely on 100% of the time? Don’t you want to have a repertoire that takes out even much higher rated opponents and gives you an unparalleled edge in the middlegame and endgame? Most club players think it is not possible without hiring a super-expensive coach and paying him thousands of dollars for private lessons… And it was that way for a very long time. The good news is – it is not the case anymore! You can get a very effective, yet easy-to-learn repertoire customized for your own style by following a step-by-step instruction from one of the top opening preparation experts in the world – GM Yermolinsky! GM Yermolinsly is the world champion of chess coaches, or if you wish, the world champion of opening preparation. That’s exactly what helped him at beating Garry Kasparov a few decades back. And now you can get a great deal of GM Yermo opening preparation wisdom from his comprehensive opening repertoire course. The course based on concrete examples and opening preparation “secrets” that he never disclosed before [at least to the wide audience]. Aren’t you tired of getting those “bad middlegames” time after time? Don’t you think you deserve to have better positions, enjoy the game and get that win? I certainly think you do. And this course is something that will definitely help you at outplaying your opponents straight from opening and getting a much better middlegame position. – BONUS #1 [$20 Value] – Complete set of PNGs is included with this course for your convenience and further analysis. – BONUS #2 [$25.95 Value] – FREE 3-month membership at Internet Chess Club (ICC). Only available to first 25 buyers.